There were 48 superyacht sales in May according to our records, the highest May tally for at least five years. It’s nearly three times the sales figure in April 2009 and the third highest tally of any month in the least five and a quarter years. The largest brokerage boat sold in May was Corsair’s 90m motor yacht Nero, which is also the largest yacht sold to date this year. 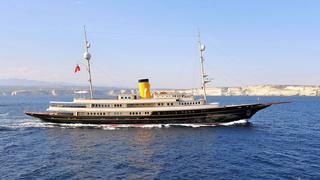 Note also the sale of three prestigious Feadship’s motor yachts: White Cloud (now Falcon Lair), Nara (now Kingdom Come) and Paraffin. Twenty-six superyachts came to the market in May, up on the previous month’s 25. The largest in May was the 55m sailing yacht Marie launched by Dutch yard Vitters in 2010, followed by the 46.3m motor yacht Charisma, launched by Feadship in 1985. According to our sources, nine new superyacht orders were made in May, down when compared with 11 orders in May last year. They include very large projects in The Netherlands between 90m and 65m. Details about them remain confidential for the moment, only few details were released, for instance, for a 70m Feadship superyacht designed by Bannenberg & Rowell which should be delivered in 2016. We know of 17 superyachts launched in May, a result clearly down compared to the one of last year. But more yachts are already launched this year compared to 2013, with respectively 85 and 77 launches. The largest was CRN’s 73m motor yacht Yalla, the second largest launch this year so far. Second in terms of size was 66m motor yacht Ester III from German yard Lürssen, followed by the first 66m ISA Granturismo motor yacht. Eleven of the yachts were over 30m long and eight were Italian-built. There were 14 superyacht deliveries reported in May. The largest was the 55m Amels motor yacht Astra, now available for charter, followed by the 47m Benetti motor yacht Anastasia K (hull FB503) which was spotted in Barcelona last week.